Dr. Parchuri is a proud graduate of Kansas City University of Medicine and Biosciences College of Osteopathic Medicine. He completed his orthopedic residency in Tulsa at Oklahoma State University Medical Ceneter followed by a spine fellowship at Texas Back Institute in Plano, Texas. He has been practicing in the Tulsa, Oklahoma area since 2010. He has over 10 years of professional experience in orthopedic surgery and orthopedic surgery of the spine. 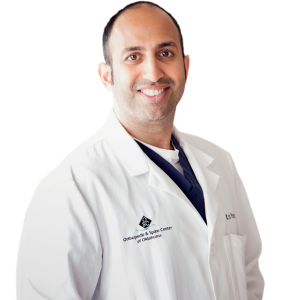 Although Dr. Parchuri specializes in spine related diseases and disorders, his practice area also includes general orthopedics. He is experienced in treating all types of fractures as well as shoulder, elbow, hand, hip, knee, foot, and ankle related conditions. His true passion is in helping his patients reduce or eliminate their pain using the latest treatments available. He specializes in bringing the best possible procedure and treatment to every patient by connecting with them on a personal and professional level.